In my pre-cooking years - I must have been an infant then - I used to think that Valentine's was a day worth spending out, dining and drinking with the love of one's life. As a culture, we've been conditioned to think that this special day and evening would be exulted to magical perfection if someone else took care of the kitchen. Well , we've learned , maybe the hard way , that our romanticized notion of romantic dinner on Valentine's day leave much to desire.At my home, the Queen has banned eating out on Valentine's day. My remedy. Candle light dinner at home, enjoying a my own versions of Valentine's day special, and a few good wine pairings, each filled with emotive and romantic connections. So I present to you my modest Valentine's Day 2012 , Dinner Special Men, that the Queen and I enjoyed. I created small florets using some barely blanched yellow zucchini ribbons arranged over some thin slices of . Each were cooked independently , each seasoned and flavored differently . EVOO and sea salt for the base potatoes. EVOO, hints of light white wine vinegar and herbs for the ribbons. This risotto had a very delicate and balanced flavors . The creaminess emerged less from the addition of grated Parmigiano Reggiano , and butter (which I barely used this time) , and more from the rice , and some of the potato starch recuperated from the water where I blanched the potato slices. The herbs were kept on the lighter side so that both the lobster flavors, and delicate taste of the zucchini was allowed to reign. Note, the zucchine were in essence used uncooked, tossed into the mixture 30 seconds before turning off the heat. The crunchiness of the squash, added to the experience. And now a few notes on the wine. 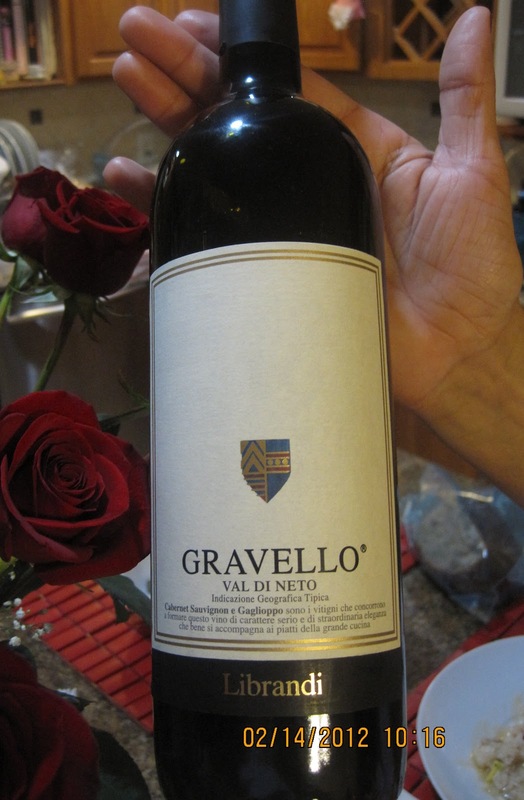 t was the first time that I was able to find, this Gravello di Val di Neto, an IGT wine from Calabria, the region of Italy where I was born. The importer, Librandi , tells us only about 90,000 bottles of this wine are produced. Sounds like a lot but it is not . I had held on to this bottle for a couple of weeks now. 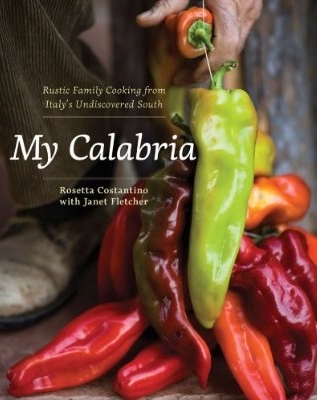 The strong connection to Calabria meant for me that this wine would be perfect for a special occasion. Valentine's would be it. Typically, a white wine I owuld have paired a white wine with today's dinner, but I decided to break the rules. Risotto or not, I was going to let my heart do the talking. I will skip the preparation details here. Wink Wink. Got some "homework" to do. Peace and Love My Friends and Happy Valentine's Day.